Over the next 16 hours, we saw the previous 12 days worth of gains wiped out as Bitcoin fell 13% from ~7400 to ~6400 at the time of writing. It was the largest (percent-wise) single-day drop since March 29th, and the first precipitous drop since February to come after an uptrend and not preceded by some significant sideways trading first. The drop was the most “unpredictable” one since February, as others had multiple signs pointing towards a breakdown. This is especially evident when looking at the sentiment surrounding the run-up, with many people calling the slow and steady rise a “good sign” and calling for slight pullbacks — but not total breakdown. 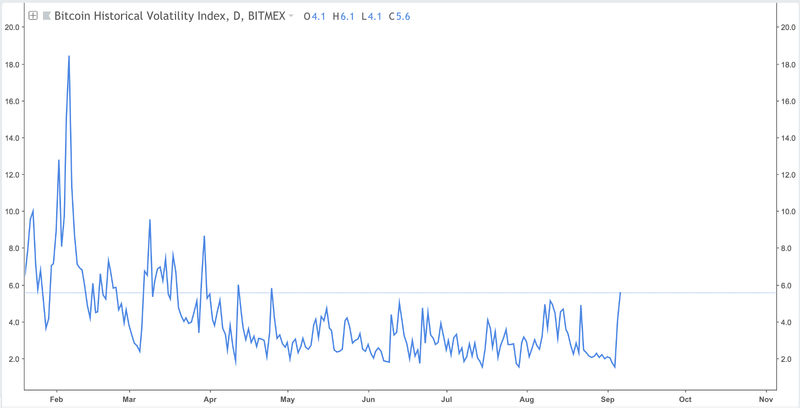 This drop also caused a 282% increase in 24hr BTC volatility, which was testing year lows at the time. So, can we figure out the reason? As with every major drop in cryptocurrency, people look for a reason. The most common boogeymen over the past year have been ETF denials, Chinese crackdowns, and Korean bans. 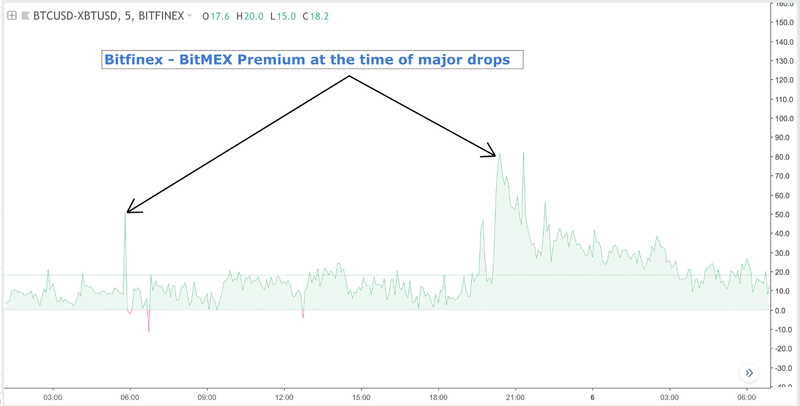 More often than not, major news outlets will report that something caused the price to drop when in reality the drop had nothing to do with the news and was just coincidental timing. In order to figure out whether news affecting the price, you have to look at a few different things such as timing, volume, technicals and other potential influences such as weak market structure. So, I dove into the possibilities for the Bitcoin dump and explored 3 distinct theories. Theory 1: Goldman’s announcement about rolling back a trading desk affected the markets, as reported by multiple headlines. I’m listing this theory first because many major news outlets reported that the drop was due to the Business Insider article that reported Goldman Sachs was rolling back plans to introduce a trading desk. However, when you look into the timing of price action, the facts do not corroborate this story. The article was released approximate 30 minutes after the initial 3% drop, and 5 minutes after the second 3% drop of the day. Bitcoin then held steady for the 12 hours following the release of the article and resumed its free fall 12 hours later at 7:30pm EST. The final nail in the coffin of this theory is the lack of market reversal when it was announced by the Goldman CFO, that the article was “fake news”. Theory 2: Silk Road Bitcoins were dumped on the market and drove down the price considerably. A recent Reddit investigation found that a wallet linked to the Silk Road with 111,114 BTC recently started to move it’s holdings for the first time since 2014. Of the holdings, approximately 11,114 BTC was moved to Bitfinex and 4,421 BTC was moved to Binance, indicating an intent to sell on the market. Judging the overall impact on the market requires a look at the total volumes for the day. The total volume was 55.5k BTC on Bitfinex, and 61.8k BTC on Binance. The holdings of the Silk Road were of enough substance to drive the price down, as if all holdings were liquidated immediately it would have accounted for more than 10% of the daily volume, which would contribute to significant downwards pressure. 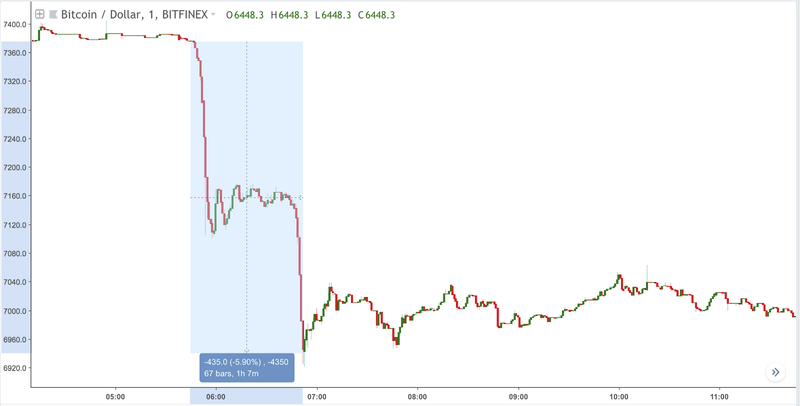 However, it looks as though the BTC/USD contract on BitMEX was the first to go down, which goes against the assumption that dumping on Bitfinex and Binance was the driving factor of the first two large candles. Although the volume was sufficient, the actual market reaction indicates that the Silk Road address did not spark the dump. Although it may have been further exacerbated by selling from the address, it was not the main cause. Theory 3: It was a technical breakdown, and large sellers saw an opportunity to crash the price. 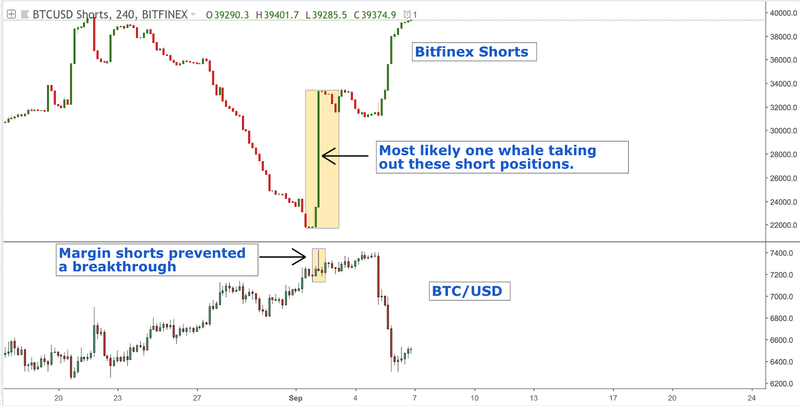 Three days prior, on September 2nd, we saw a massive uptick in shorts, which was easily swallowed by the market, giving bullish hope to many traders who witnessed the fabled “bull whale of Bitfinex” swallow up sell orders with massive hidden buy walls. You can see in the chart below that the margin shorts didn’t move price, although they did single-handedly prevent a break of resistance. 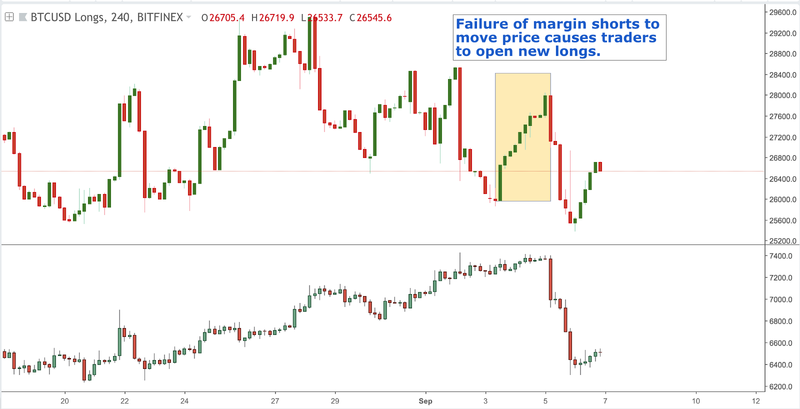 Following the shorts failure to drive down the price, retail traders began to pile in longs as they felt safe in a seemingly “bullish” market structure. This piling on of longs set up the market structure to be weaker, as a long squeeze became a real possibility if the price took a turn for the worse. Of course, that’s exactly what happened, and once the price dropped, these longs were forced underwater. Retail traders will often close positions quickly when in the red, and we saw that effect take place as the dump kept cascading. 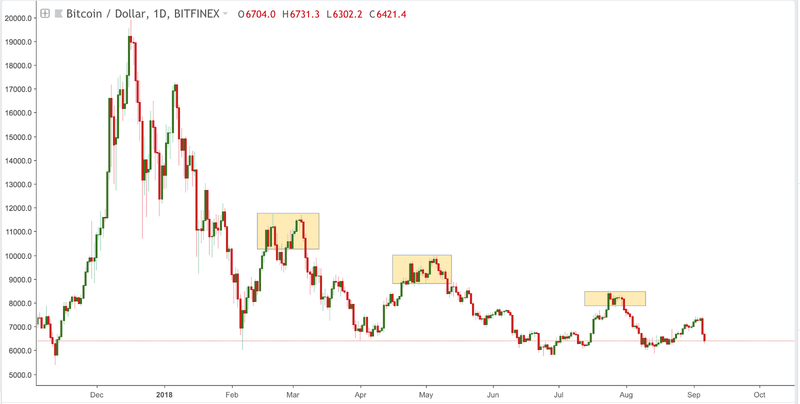 This dump was not caused by a singular catalyst and was likely just an issue of market structure flipping from bullish to bearish due to Bitcoin running out of steam, and further exacerbated by large actors taking advantage of retail tendencies. Often, there are no direct reasons or catalysts for price movement. Especially if attempting to trade, it’s important to explore developments with a critical eye to ensure that you’re teasing out correlation and causation from price movements. If you’d like to get more regular updates of my take on the markets & blockchain, I write a 🔥 daily crypto newsletter, where I publish my take on the market, recent developments and all things crypto.